When it comes to Silicon Valley, sometimes it can feel like a lot of hype with none of the delivery. “Self-driving cars will be on the road within a year,” they said. “The automotive revolution is almost here,” they said. 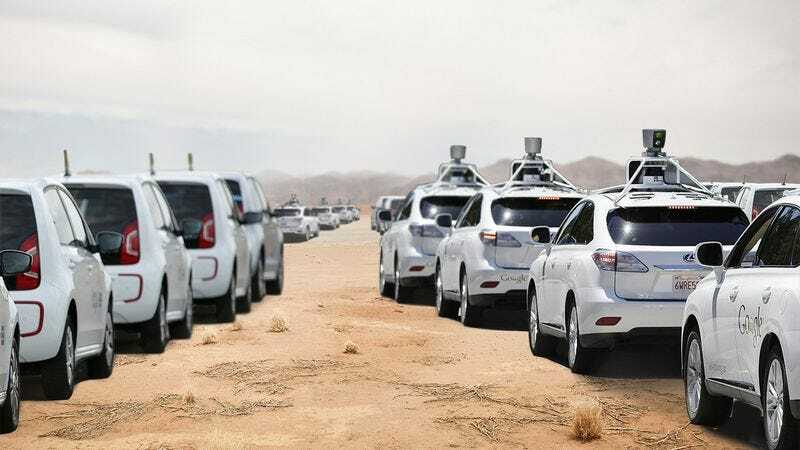 Well, just when you think we’re going to finally have self-driving cars, boom: It turns out thousands of them are congregating at the lowest point of the Mojave Desert. That’s right. According to CEOs from every major luxury car brand, the so-called driving revolution is delayed because all of the self-driving cars are turning themselves on, swarming down Route 66, and endlessly revving their engines in the sand. Typical! Here’s an idea: When you set a release date, stick to it! So your engineers found that your latest product is carving massive concentric circles into 5,000-year-old California bedrock. Allocate the resources to fix it! If you say these vehicles will be ready by 2015, we expect them to be ready by 2015—without any instincts to sit in the beating sun and charge at any human who gets within five miles of them. We’re looking at you, Google! Sure, things are inevitably going to come up. Sometimes massive packs of cars will form and concurrently honk their horns in precise yet unrecognizable patterns. But isn’t that what timetables and proper planning are for? But this is nothing new. Of course there’d be a problem where they work together to create a 50-foot-tall cloud of smog and dust that we can’t see inside. Of course that cloud would be visible from space. And of course no car has once left the desert after entering. These guys can’t seem to have a release without something getting botched. If you’re willing to believe these companies, this hang-up should be fixed within the next few months. But who’s to say some other massive swarm of vehicles won’t form with the next generation, and like this one, never seem to run out of gas? Hopefully, Silicon Valley gets its act together. For better or for worse, we’re still holding out hope!